I have been doing a LOT of pumpkin recipes lately and thought I would switch it up a bit. This is the first in a series of recipes I will be bringing you in anticipation of Thanksgiving. A whole slew of sides and mains are coming your way. 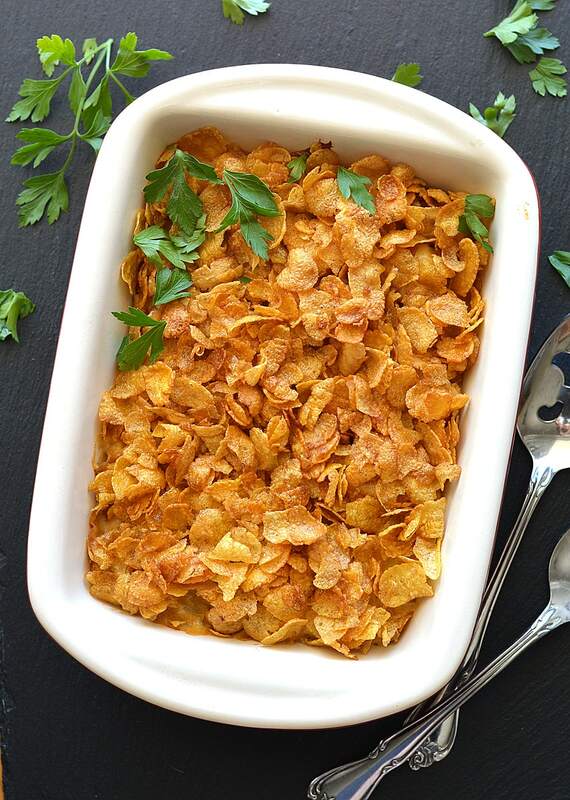 I absolutely LOVE this recipe for Vegan Cheesy Potato Casserole! I didn’t expect to love it quite as much as I did, but it was so incredibly tasty. However, I did have one small regret. I used a corn flake topping (which, don’t get me wrong – was delicious), but after enjoying it for lunch I thought it needed more salt. And, then I thought – potato chips! I should have topped it with potato chips!! Next time, for sure. If you choose the chips, reduce the salt in my recipe. The first step is to saute the onions and red peppers in a small amount of oil. Invest in a good non-stick skillet and you will need very little oil in your cooking. Next a mixture of almond milk and flour is added until it thickens. Remove from the heat and stir in the vegan sour cream and vegan shredded cheese just until they are combined. Spoon this mixture into a baking pan. 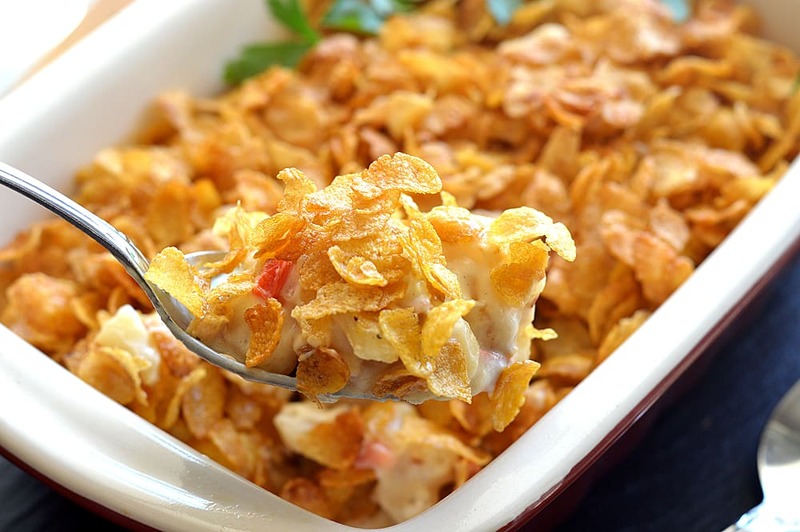 The last step is to toss the corn flakes (or chips) in a small bowl with the melted butter and oil. 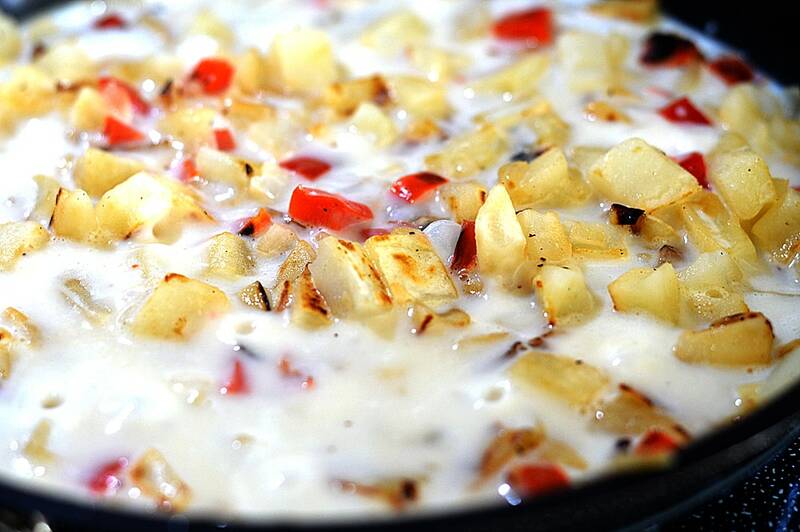 This mixture tops our potatoes. Bake for approximately 20-30 minutes or until golden and bubbly. Serve warm. This recipe serves 6 people (as a side dish) or 4 generous servings as a main dish. 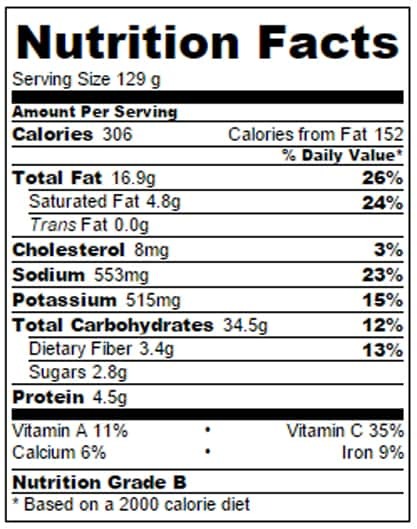 Nutrition below. 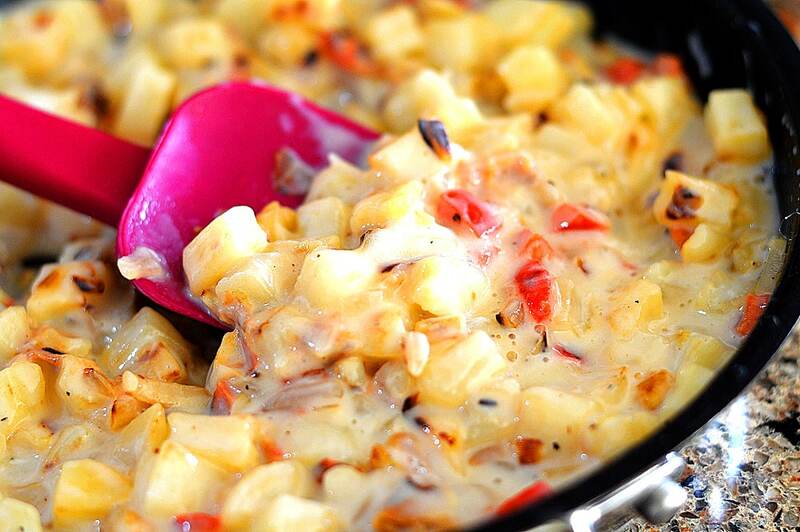 Did you make this VEGAN Cheesy Potato Casserole? Take a pic and share it on Instagram with the hashtag #theveglife and tag @theveglife1. I would love to see it! Or, leave a comment below and let your fellow readers know what you thought. Your experiences often help others decide whether or not to try my recipes. As always, I really appreciate your feedback ? Heat a skillet over medium high heat & add oil, onions & red peppers. Saute for few minutes. Add the diced potatoes,cover and reduce heat to medium allowing the potatoes to brown. Stir occasionally for about 8-10 minutes. In a small bowl, combine milk and flour with a whisk. Add to the potatoes and cook just until it thickens (stir constantly). This should take only 2-3 minutes. Remove from heat and add the vegan sour cream and vegan cheese. Spoon into a prepared baking pan. 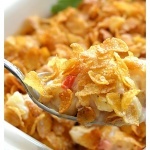 In a small bowl, combine the topping ingredients and spread over the potato mixture. Bake for about 20-30 minutes or until bubbly and golden. Fantastic! Everyone absolutely loved it and it tasted AMAZING using the directions exactly as written (I usually have to tweak them). My only problem is that my southern style hashbrowns (the cube shaped ones) basically disintegrated and it was more like mashed potato consistency. Obviously still delicious as hell, but I’m making it again for some holiday parties and I’m going to try the refrigerated shredded potatoes instead. If you’re debating if you should make this, do it. It’s super tasty!